The wide covered mahogany front porch provides access into the colonial house at 364 Hulls Highway. 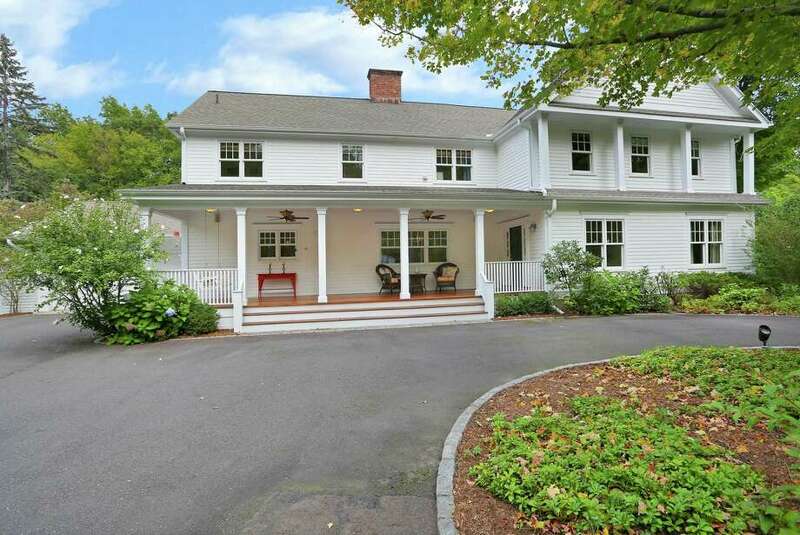 FAIRFIELD — There are so many things to love about the colonial house and its one-acre level property at 364 Hulls Highway that the current homeowners drew up a page-long list of what they will miss most. Topping the list is location. This property is conveniently located in the Southport section, north of the Post Road (Route 1), only minutes from historic Southport Village, scenic Southport Harbor, and downtown Fairfield. It is walking distance to the Southport train station and the Wakeman Boys & Girls Club. It is an easy commuting distance to I-95 and the Post Road and all the shops and restaurants along it. Versatility of the 4,206-square-foot house is also high on the list. The house was which was built in 1960 and was recently updated. Because of the layout of the three floors and the easy flow from room to room there are multiple purposes for some of those rooms depending on the needs of the family that occupies the space. A stone wall borders the front of the property. Stone pillars topped with lanterns mark the entrance to the circular driveway lined in Belgium block, which leads to the attached two-car garage and the wide covered mahogany front porch. Sidelights flank the front door, which opens into the foyer. Off the foyer there is a wide entrance with decorative columns into the formal dining room. The current configuration of the rooms puts the formal dining room off the foyer, access from a wide entrance with decorative columns. Unlike most traditional homes the formal living room is at the back of the house. This sizable room features a fireplace with a raised hearth flanked by built-in bookshelves and at the far end there are French doors to the upper slate patio, which has steps down to the lower slate patio. As an example of this home’s versatility, the living room is large enough that it could really be divided into a separate space, perhaps as a den, television room or first floor office. There is also a dedicated office on the second floor. The current owners love their gourmet kitchen, as well they should. It features a stone fireplace in the eat-in area where there is also an L-shaped banquette. There is a center island, marble counters, a dry bar area with a beverage refrigerator and glass-front cabinetry, a walk-in pantry, and high-end stainless appliances including a professional six-burner range. Off the kitchen is a mudroom with built-in cubbies and a bench, half bath, and door to the driveway by the garage. In another wing of the first floor there are two bedrooms, both en suite. The bathroom of one of those bedrooms has a floor-to-ceiling iridescent blue tile backsplash. The other bedroom is currently used as a media room. On the second floor there are five bedrooms, the office, and a laundry room. This house has a second laundry room in the full, partially finished basement. The master bedroom suite features a tall vaulted ceiling, sitting area, double-height walk-in closet, and French doors to a private balcony. The updated European style master bath has two separate pedestal sinks, stone floor and backsplash, a decorative pattern in the floor of the shower, and a jetted tub. There is a fort or club house “hide-away-loft” space between two of the bedrooms. One of those bedrooms has a climbing wall that leads up to that space and the other room has a ladder to that same space. In the basement there is playroom and gym area with a mirrored wall. Outside, in addition to the two-tiered patio the current owners create an ice rink for hockey and skating parties next to the fire pit every winter. For more information or to make an appointment to see the house contact Jackie Davis and Katie O’Grady of William Raveis Real estate; Davis at 203-258-9912 or Jackie.Davis@Raveis.com, and O’Grady at 203-913-7777 or Katie.Ogrady@raveis.com.